Thread, thread, thread. 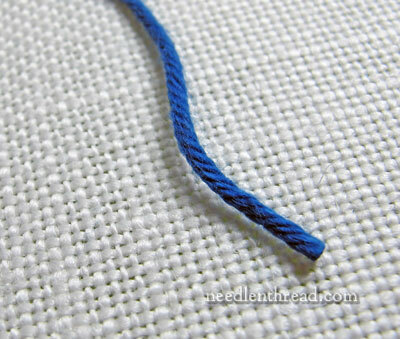 I love talking about needlework thread! Here’s one you don’t hear much about, but it does exist, so I thought I’d tell you about it. Yesterday, we looked at the difference between the general shape of a backstitch line compared to a split stitch line, and how that shape helps determine the suitability for using one or the other as an outline underneath the edge of satin stitch or long & short stitch. To demonstrate the point, I used a thread called DMC Retors Mat 4 (Art 89). It’s a strange name. And we don’t hear about this thread too often here in the States, because, although it’s a DMC thread, like many DMC threads, it’s not distributed by DMC USA. So, if a shop carries it, it’s imported from DMC in France. DMC Retors Mat 4 is predominantly used as a tapestry thread – that is, it’s used more for needlepoint or canvas work than for surface embroidery. It’s a very thick thread, and it’s a soft thread. This is one of the older skeins of it, with an old label. I love old labels on threads! And look! It even has the pull skein picture on the number tag! If you look at the thread up close, you can see that, in a way, it looks more yarn-like than thread-like. It’s thick and soft, with a good twist to it, though it isn’t as tightly twisted as perle cotton. There’s a hint of fuzz to it, though it isn’t fuzzy like wool. The thread is non-pliable. It’s meant to be used as it comes off the skein, without any separation in the plies. Here, I separated the plies to show you that it’s a five-ply thread, and when you separate the plies, they lose their twist and become even softer and almost wispy. The whole thread loses quite a bit of stability when separated. It isn’t meant to be stitched with, taken apart. The thread, during the manufacturing process, is gassed and combed, so that it doesn’t pill when you stitch with it. It’s quite smooth stuff! It’s a mat thread (like the name suggests), which means it hasn’t been mercerized so it doesn’t have a shine to it. 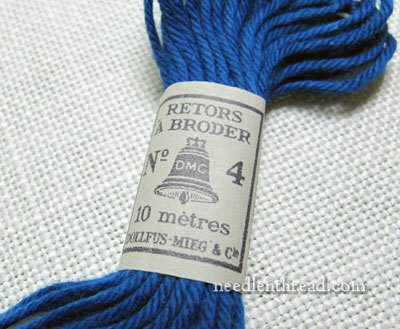 While the most common usage of DMC Retors Mat 4 is in needlepoint (it’s also apparently recommended for use in making Brazilian bracelets), the thread does have its uses for embroidery. It’s definitely too thick for your typical crewel-design-on-linen type of embroidery, but it’s a really nice thread for embroidering on wool and flannel blanketing. If you like to embroider blankets, you might check it out. I’m thinking about using it on a length of purple wool blanketing that’s been sitting in my cupboard for eons. I want to stitch up a “doodle blanket” with it, and I’m thinking this thread could figure heavily in that project. Additionally, Retors Mat 4 can be used in different styles of folk embroidery that feature chunkier, soft thread. I find it a little too heavy for traditional Hungarian redwork, but it could actually work for that. In fact, it was recommended to me to use this thread with one ply removed, to mimic more closely the traditional thread used in Hungarian red embroidery. I find the thread too unstable when a ply is removed, but with care, it would work. Another use? It’s a wonderful thread for kids using plastic canvas. If your little one has graduated beyond yarn on canvas or cardboard, and is producing little ornaments and the like, this is a good thread that’s manageable for a child, and that has a much more attractive finish than yarn. DMC Retors Mat 4 comes in over 280 colors. It’s hard to come by in needlework shops, but online, you can find it through Lacis. A Google search will also turn up some needlepoint shops online that sell it, and that show the color charts. You can also search for it on eBay. In fact, that’s how I got my stash of the stuff. A friend sent me a link to a listing that had all the colors, many with repeats, mostly full skeins, on eBay for under $50. It was one of Those Things I Couldn’t Pass Up. In looking on eBay, I noticed that some sellers say that the thread has been discontinued. Whether or not this is true, I haven’t been able to determine. Perhaps it was once distributed here in the US by DMC, but is no longer, and that’s what they mean? At online needlepoint shops in France, it seems to be available with no hint of non-availability, and the same is true of the few online shops where I’ve found it here in the US. I’ve tried to contact the company, but no one has returned my queries. NB: DMC was badly hit with Hurricane Sandy, and were out of contact for almost three weeks. I’ve heard from them now – the Retors Mat 4 is still made and sold widely in France, but not distributed by DMC in the US, though some shops do source it from France. So, if you’re interested in embroidering wool or flannel blankets, if you are pursuing any of the “chunkier” styles of folk embroidery, or if you teach children to embroider and like to use plastic canvas, you might check out DMC Retors Mat 4. It’s a nice thread. I like it! What about you? Have you used Retors Mat 4 for any needlework projects? Any views on the thread or ideas of how it can be used in different types of embroidery? Feel free to leave a comment below! I have used this as then”string padding” in gold work. Same here, we were shown to use this thread for string padding at a recent 3 day RSN goldwork worksop that I went to here in the UK. Incidentally what we were given in our kits was shade 2742.It is nice to work with, and stands up well to being drawn across beeswax. I use this for temari. Found the full line in several stores in Munich last month. It gives a very homespun appearance when stitched. This link is from the DMC website, which clearly shows all of the available colors, so I highly doubt they have been discountinued. Other than sheen, what is the difference between this and perle cotton? Yep, at least I did… On dmc site they suggest to vacuum clean it though, but on Coats site I saw a note that Anchor soft cotton can be washed even in very hot water. I am pretty sure this thread is almost the same as Anchor Soft Embroidery Cotton but I don’t know if this thread is still available or not, Mary. I have a small stash of Soft Emroidery Cotton dating from way back and it was always a favourite of mine for fairly bold surface stitchery. Judging by the photo I would say it is the same thickness as the DMC one shown. I also have a few skeins of the DMC one but haven’t seen it on sale in the UK for some years now. I am french and i can assure you that this thread is not discontinued. It’s the most common thread for canvaswork. Mary, i wish you a very happy new year. Happy new year too for all your readers. I used Coton Retors when I was unable to source genuine Mountmellick thread for a Mountmellick embroidery. It showed up very well on cotton sateen fabric. I have also used it for padding in stumpwork under other cotton thread. Very happy to hear it is not discontinued. Thanks. 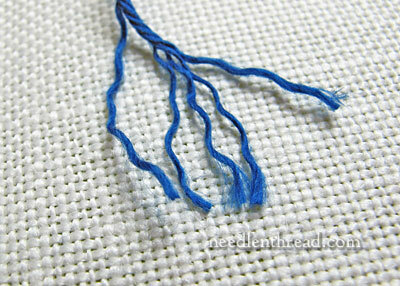 I used thread like this once for a tapestry project that came in a kit. I ran out of white, but didn’t see anything remotely similar anywhere else. Now I know why! G’day Mary, that’s really interesting. Hubby got me a bargain on ebay. He picked up some items and the seller had stacks, literally, of these threads in their original old boxes ready to list. He bought them all! I love old labels too and old boxes or containers, especially that have the original item/s still in them like these. I wasn’t familiar with the thread but loved it. Have actually been a shy of it but now I know he didn’t get a ‘white elephant’ I’ll get them out again. I’ve written on the big carton I’ve stored them in, ‘DMC tapestry cottons – thick and soft, old’. I’ll be away tomorrow but am keen to have another look and see just how many and what colours. There must be about 60 boxes, a far cry from your 280 though, and containing from 2 skeins to almost a full box. I’ll be interested to see how close I am for count. Thank you once again for the insight into obscure needlework items, or ones that are just plain overlooked or so everyday that we don’t give them the credit they deserve and therefore miss opportunities to use them to their full and interesting potential. G’day Mary, have just had a lovely time counting my boxes. I’d guessed 60 but there are91, so although far from a full set there are an average of 4 or 5 per box, no repeat colours but quite a few consecutive colours so i’m really pleased. I love to use this thread as a padding under other threads. It is especially lovely when you need a padded line, and adds nice dimension to your stitching. Mary, I’m wondering if it would work for Mountmellick, not that I’ve actually done any yet. I carried this thread in my shop. We closed about nine years ago. We were notified by our distributor that it was discontinued. I brought home all that was left when I closed. It is a wonderful thread and I sold a lot for stitching 13 ct. canvases. Thank you for this text. For me it is just in time. Few days ago I’ve bought many of such skins (some 200 or even more, but only about 10 colours) in one second-hand shop of clothes… One skin costed about 12 & cents. I had to buy them all. My threads also have old labels, but their pull skein pictures are different from yours. Maybe they are European? Now I am looking for a heavy natural linen to stitch a tablecloth. I can;t believe this post. I was on your blog last night trying to find info on this very thread because it was not coming up searches! I have ended up with just a few skeins of this from a vest using very large aida. Needless to say, glad to see this post. Have you tried Sulky Petite 12wt cotton in 50yd spools they also have 500 yds spools? I tried this instead of black floss to finish a project. Doing the split stitch was easy. Love the older labels on everything! I’m wondering how this would work for crochet since it’s yarn-like. I love Irish Crochet Roses and look for other fibers to use than just crochet thread and baby yarn. Probably crochet jewelry would be nice too. Would love to get some to try at a later date. Crochet is usually better in a ‘z’ twist yarn or thread, and this is an ‘s’ twist. But ‘s’ twist is nice for knitting. Looks like nice thread. I have been thinking of embroidering on a fleece blanket, maybe these would work. thanks! This is one of the easiest-to-find thread in France and not discontinued ! It is a very soft thread which reminds me of my first embroidery stitches at school some 40 years ago… but I think I never used it since. I “stole” my mother a few skeins during Xmas holidays as I intend to use it as string padding in goldwork. Some years ago we were told this thread was being discontinued (I’m in Canada) so I bought up what my then LNS had for my DD and her macrame bracelets. Then a couple of years ago (or less) I noticed it being used in Italy. Could this be like the rayon thread that got discontinued and re-released as the satin thread line? This is a heavy mat coton thread and has nothing to see with the shiny 6 strand satin floss. This is intriguing-DMC- have they discontinued lines or not.I have used DMCs Medici a very fine tapestry wool smoother and finer than Appletons A few years ago I was told that it had been discontinued and would be no longer available.As it is beautiful for wool embroidery I was heartbroken and promptly brought all I could afford at the time and when I come to the end of it I dont know what I will use.Does anyone know if it is still available elsewhere? I discovered DMC Soft Cotton in a kit purchased in Australia but then found it difficult to source in New Zealand. My favourite shop is now selling the entire range, bless his socks. I am using it to embroider a cushion on linen, very large and bright flowers. Just love it. Such a shame to only use it as padding, give it a try for something bright and different. I live in Turkey and this DMC wool as well as Anchor is readily available and very reasonable. It’s mainly odd lots and I buy a lot of it. I use it in making needlepoint handbags on plastic canvas or large canvas. It looks great and there is a tremendous range of colors, much more than with yarn. I have made bargello patterned handbags/tote bags with it because of the color range. This thread is great for working Florentine embroidery on 18ct Floba, a soft evenweave fabric, when you do not want to work on canvas. To answer your question, Mary, YES it was distributed in the US. About 25 years ago (eek!) I liked across the street from a DMC rep. He had a garage sale and was selling off some of his stuff as his lines changed (you can bet I was first in line!! oddly enough his wife had no interest in needlework) — and I got a DMC cabinet full of samples of this Retors Mat 4. It was probably being discontinued at that time. By the way, the threads were in the old style DMC cabinets that had wood bottoms on the drawers, so if a cabinet was too stuffed, the threads would scrape the bottom of the higher drawer — this surface, being rough, made the top skeins pill… So this thread WILL pill if it receives enough abrasion. H iMary, I asked the owner of http://www.theFrenchNeddle.com (via her facebook page) if the thread was still available in France and she says it is, but she does not stock it herself. I am wondering that if enough people ask her for it, she may carry it in her online shop?? Hi, Marian – I’m not sure there would be an overwhelming interest in it, to make it affordable to carry it as a new line, but … maybe. There are some shops in the US that carry it already – Lacis, for example, carries the whole line. So it might not be worth investing in carrying it, for a small shop, unless there was a huge demand for it. I don’t see that necessarily happening…. but…. who knows? It is for sale on Ebay right now. One of my favorite yarns for needlepoint. I have 1 part skein of Coton Retors Mat 4 and thought it was the same as Coton a Broder which is also hard to get here now. There is a difference though as the Broder has a slight sheen. I have a old semco tapestry that was given to me but the cottons that I was given with it are retors mat dmc. My inquiry is how do I find whether I have the correct colours to complete the tapestry? I have always used DMC Retors 4 thread for my needlepoints. I haven’t done a needlepoint in a while and I want to get back into it again, but I am having a hard time finding the thread I need, Thankfully I found one store that still sells it, however they do not have all the colours. I phoned DMC USA and was told that this thread has been discontinued. Apparently it is not a big seller. Hopefully I can find another source for this thread. I’ve been searching for DMC Medicis wool, because I think it’s the right yarn to use when cross stitching a pattern from the Danish “Haandarbejdets fremme” and the yearly calendar from 2000. I only have a very used paper copy of two patterns (bought on a flee market) from the book and the yarn page (even more damaged) so there is no information about what wool yarn to use except color codes… When searching I noticed that some of the codes from Medici worked. – choose “Silk & wool” to the left. – Now you should see the DMC Medicis logo on the screen (right in front of you!). – Press on this picture. Aaand here comes the yarn! In my world this means that it is possible to buy this yarn, or am I wrong? I hope this is of any help! If anyone knows anything about what wool yarn I shall use when cross stitching, please let me know! Thank you for your contact info. I purchased a needlepoint canvas just recently in Marseilles France & bought the specified amount of DMC threads listed. I didn’t notice the different texture until starting to work on the project – wonderful to work with. However, I was short in amount for 1 color & could not find this thread anywhere. Thanks for your info. I am from South Africa visiting Greensboro North Carolina and need more DMC coton retors mat to finish my tapestry. Is there a store in Greensboro where I will be able to buy? This is my 7th tapestry using DMC coton retors mat. It is a beautiful thread, every tapestry has been a success! I am now 70 years old and they will make beautiful presents when I get older! I haven’t needlepointed in years–starting up again to find that this isn’t imported to US anymore–such a shame, it is one of my very favorite fibers to use–perfect for 13 count canvas. So soft and easy to stitch with and looks beautiful, provides a completely different texture if you like working with multiple fibers on one canvas. I have been using DMC 4 for years for tapestry/needlepoint. I recently ran out of the white in order to finish the background of a needlepoint for my great grandson’s nursery and am desperate to find it. It’s a great thread for needle pointing. I used this thread years ago. i purchased at a needlepoint shop with the canvas sold separately. The needlepoint shops around here have all closed. I haven’t seen this thread since. I loved working with it and wish I could find a shop that sells it. 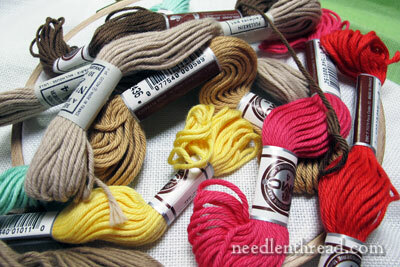 I purchased a stitchery kit using the DMC cotton retors mat 4 and was shorted one of the colors. I need 3 skeins of color 2799. Can you help me? I think it might be the same as DMC soft cotton which is available in uk. Estoy interesada en comprar algunas madejas de hilos RETORS A BRODER. Por favor me envían información: Gama de colores, valor y forma de pago al mail adjunto. Hello, Blanca – I don’t actually sell thread. I think it is still available in Europe, but I believe it is discontinued in the US. Have used this to crochet flowers, leaves, and lace. The thread is very soft, and the mat appearance gives a “vintage” appearance to the items made. Hi, is DMC retors mat cotton washable? I have a lovely piece of embroidery that has become grubby, but I’m worried the darker colours will run if I give it a gentle cold water wash. Any tips? My mother has two D.M.C. canvas armchair ( LouisXV). beige colour (Retors D.M.C. No 4 – 10 metres DOLLFUS -MIEG &Co Number 2611). The label is exactly the same style as the above pictures in blue thread. Hi, Marianne – I’m not sure where you can find DMC Retors in Australia. It’s not widely distributed here in the US, either, but it Lacis in Berkeley, California does carry it. You can find it on their website: http://lacis.com/catalog/ by using the search bar at the top left column and typing in “Retors” – it will come up in the search results. It’s not too expensive, but I’m not sure what their international shipping is like. Hope that helps! you might look at a new DMC thread, (well new to me,anyway) called DMC Soft. It looks very similar. MATTE COTTON – 100 COLORS AVAILABLE on DMC ‘s USA website. Care and Washing: Dry clean only. Iron at a low temperature. Do not wash, bleach, or tumble dry. 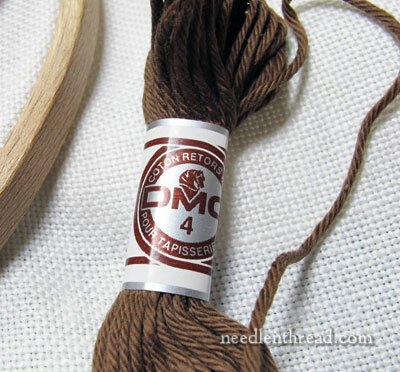 DMC Soft Cotton is a matte tapestry thread, also known as Retors Mat. The thread is combed and singed by flame to remove fluff and contains 5 inseparable cotton strands made of 100% long fiber cotton. DMC Soft Cotton is available in a 10m/10.9yd skein put-up. 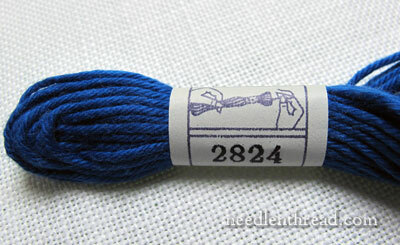 This single ply thread is ideal for needlepoint, crewel, hardanger, weaving and more. 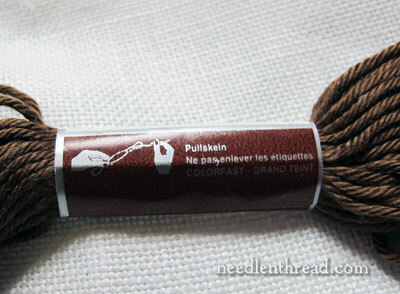 Matte Cotton is a sturdy, dependable thread, making it a great for braiding and weaving. I purchased a French needlepoint canvas at an estate sale along with cotton Retors No 4 thread. Unfortunately I have run out of many colors. How do I get a color sample chart and how can I order this? I live in France and use Retors Mat all the time. I often buy up vintage stashes, and a lot of them contain this thread. I use it for needlepoint, for couching and for outlining motifs (I do a daily embroidery in a heart motif). It really is very very matte, so is best used where you might use wool. I haven’t tried embroidering blankets with it, but I feel that coming on… I have unplied it and used the single plies for a soft, fuzzy effect when depicting snow, it, but it has no strength at all and you need a large needle, as if it drags in the fabric, it just falls apart. I just bought 10 skeins in Brittany France on vacation. Not sure how I’ll use it yet. But I couldn’t pass it up. I know this is an old topic, but I found that Herrschners has DMC Soft Matte Cotton Floss, in a lot of colors.